Every time I sit down to put the thoughts in my head on paper they seem to slip through my fingers like so many wriggling fish. Writing seems to be the one thing my brain hasn’t been able to overcome in my post-college life. It terrifies me a little. I’ve spent the past year or so studying and learning just about anything I want. It has been so much fun for me to learn what I want to learn. That is why it is so frustrating to be unable to write down the the ever bubbling thoughts I have running through my head. Maybe I need to start with the private writing again, maybe the audience is my problem. I want my writing to have form, structure, a purpose. All that ever seems to come out is a flow of wandering thoughts and frustrations. So here I am, once again, unable to let go of the need to write the perfect blog post. One of the biggest hurdles that tripped me up on in college was writing papers. No matter what I did the process never seemed to get better. I’ve had lots of people give me advice but, I never figured out why I couldn’t just write. For awhile I thought it was being required to write that brought me to a stand still but, now that I am a year out of college I doubt that is the case. I have many things I want to write about but, my brain cannot focus when it comes time to sit down and write. Even while writing this post I struggle to focus. The things I think never seem to come out the same when I write them. That doesn’t make much sense I know but, my free flowing thoughts appear dull and stilted when it comes time to type it all out. Maybe it is the romance of the quick fleeting thought that makes me believe my ideas are good and the hard light of writing it out reveals there was not much there to begin with. Besides that issue, when I finally do get to writing I find that the more I write the more I lose my way. More and more ideas pop into my head and I begin to wander off. The worst part of these tangents is that they sometimes seem like better ideas then my original one. Or am I chasing the thrill of exploring a new thought? Mostly I write this post as a way to write again. I don’t like the way most of it sounds but, if I publish it maybe it’ll push me to start writing again. The frustration of wanting to write but, being unable to is starting to get to me. Either my freshman or sophomore year I read Sylvia Plath’s The Bell Jar. To a certain degree Esther’s mental illness was something I could identify with and the turmoil of my thoughts at the time often found companionship with her words. 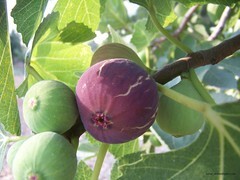 From the top of every branch, like a fat purple fig, a wonderful future beckoned and winked. One fig was a husband and a happy home and children, and another fig was a famous poet and another fig was a brilliant professor, and another fig was Ee Gee, the amazing editor, and another fig was Europe and Africa and South America, and another fig was Constantin and Socrates and Attila and a pack of other lovers with queer names and offbeat professions, and another fig was an Olypmic lady crew champion, and beyond and above these figs were many more figs I couldn’t quite make out. As a student I preferred to wander around from department to department. I took classes that covered topics I was interested in or classes taught by professors I wanted to get a chance to learn from. I was a history major on paper but, mostly a student of as many disciplines as possible. Struggling to understand the different frameworks in different disciplines was some of the most intellectual fun I had while at Mary Washington. Being the type of student who cannot settle down I often had a love-hate relationship with my major. There are certain requirements that need to be met (my inner-rebellious student just freaks out at the work “requirement”) when studying history and sometimes I didn’t particularly care for those requirements. The people who saw me stressed out by my history classes often wondered why I was a history major in the first place? It is a good question and I’m still not completely sure why at times. The best answer I have come up with is history is what happened to grab my attention first. A history class I took my freshman year was one of the first places I had a moment that you long to have as a student of anything. It was one of those revelatory moments where you see something you hadn’t seen before even though it had been in front of your face all along. Grok is still the best word I can find that describes those kinds of moments. Those moments take many shapes and forms but, you know it when it hits you. It is a brain high where your thoughts race. You understand something in a deeper more meaningful way. For me the insight was finally realizing how historians create (yes, create) history. I talked a little bit about it after my freshman year but, the words there don’t really do it justice. Perhaps because I’ve repeatedly come back to the same revelation in different ways that it is now even more meaningful to me. Throughout my K-12 experience the historical accounts written in my textbooks were unchanging facts to me. Why would they represent anything other than what had happened? History classes were about the content not about the process. It was in my first history class in college where we looked at many primary source documents that the very obvious truth of what the discipline of history is suddenly struck me. There is no magical record of all of history that is written by divine hand that we print out as truth. No, history is a struggle to piece together the past through various types of evidence. The struggle to understand what was going on at a certain time without injecting your own biases (a seemingly impossible task). The struggle to combine the evidence and your analysis to say something about the past. My freshman year was the first time I saw this process in a way I had never seen before and I wanted more of that feeling. 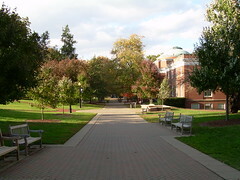 Throughout the rest of my time at Mary Washington I would run into the feeling several more times. Sometimes in history classes, sometimes in other classes. Being a history major frustrated me at times because it wasn’t always about the process and sometimes it was a bit too content heavy for me. At the same time there were some history classes where I found the content highly interesting and was less interested in the process outright. I suppose I contradict myself. I still have those moments where the reality of how history is written hits me all over again and I feel a little bit of that brain high. Maybe because writing history begins to get at the question, “what is truth?” and to me that is a compelling question. Reflective thinking is always more or less troublesome because it involves overcoming the inertia that inclines one to accept suggestions at their face value; it involves willingness to endure a condition of mental unrest and disturbance. Reflective thinking, in short, means judgement suspended during further inquiry; and suspense is likely to be somewhat painful…To maintain the state of doubt and to carry on systematic and protracted inquiry — these are the essentials of thinking. I spent a lot of time reading various blogs on umwblogs during my time at school. I had my finger on the pulse of conversations in various classes. Most often I lurked but sometimes I would comment. It was during my last year at Mary Washington I noticed a marked difference between how I formulated thoughts and how many freshmen on the first-year seminar blogs formulated opinions. It is not that the incoming freshman class was stupid (although everyone always like to say kids are dumber than they used to be) I just had reached a level of thinking that most freshman had not. I was finally seeing those intangible skills that I had been told college would give me begin to surface. It was during my last two semesters that I finally began to fall in love with doubt and skepticism. I had discovered the freedom in doubt. I found conversations that excited me and inspired me to go and do the research and learn to identify a poorly constructed argument. One of my favorite blogs to comment and challenge students on was a freshman seminar called Food Chemistry. I’m a historian by training but, that doesn’t stop me from getting in over my head in other disciplines. Most of the time my comments were simply challenging them to look at their sources, second guess their opinions, or even just provide evidence for their claim. This type of skill doesn’t require any special training in chemistry, mostly it is just critical thinking. I had a professor who likened the ability to hold multiple ideas at once to a golden retriever’s ability to hold multiple tennis balls in its mouth. At first it can only hold one but, it can figure out how to hold two or three or more. Besides giving us all a good laugh the analogy made the point that learning how to hold multiple views and hold them equally without judging is a skill that is learned. We give a lot of lip service to critical thinking. I can’t think of many people who think it is a bad thing but, surprisingly most of us are terrible at it. Now most of us aren’t terrible at in ever aspect of our lives but, from what I’ve seen of this world so far (and its not much) most people go with convenient and shallow over difficult and deep. It is true we don’t have enough time to weigh heavily on all matters in our lives, we’d never get anything done. But I hope I don’t forget that many of the opinions I hold now that I assume true are not necessarily true. And I continually hope I have the humility to admit that just because I believe something doesn’t mean its true. This is why I’ve come to love doubt and skepticism. It puts me in a position where I don’t have to cling to ideologies or defend ideas just because it is the idea I’ve always believed. I go with what evidence and logic points to and hope that it leads me to being a better, more rational person. I could go on in detail about all the ways work against our critical thinking abilities. Go ahead and take a look at the wikipedia page on the list of cognitive biases. We have a lot to overcome. I spend a fair amount of my free time working on my critical thinking skills and challenging my thinking (where was this when I needed it in college?) because I enjoy it. I almost get a geeky kind of excited when I catch myself making assumptions I shouldn’t and correcting myself. The freedom to doubt is a beautiful thing. On my last post Andy commented, asking how my education at UMW has fit in with real life. I’ve learned many things since leaving but, one of the first things that came to mind when Andy asked this question was peoples’ perception of what a college degree means. I’ve discovered most people don’t understand that having a liberal arts degree (specifically a B.A. in History) means that I can do more than teach history or work at a museum. I’m really *this* close to making a shirt that says, “Yes, I have a degree in history. No, I’m not going to be a teacher”. It has become clear to me that most people don’t understand how my degree has prepared me for than doing “history stuff”. One of the most important skills I gained while at school is the ability to think critically and apply those basic skills to fields outside of history. So while I may not have deeper knowledge of fields outside of the one I studied, I know how to get information I need and I am reasonably good at evaluating that information. One of the things I was told all the time by people at school was that my degree would prepare me for a wide variety of jobs, careers and prepare me for life in general. While I still believe that these people are fundamentally right I’ve realized that this idea is not so widely understood (or maybe it is rejected, I’m not sure) and it is a bit frustrating to have to try to repeatedly explain to people that I am more than a history major, much more. On a related note I have a post on critical thinking and skepticism in general in the works. I finished my time at Mary Washington back in December. Since my graduation I’ve been thinking about what my time at Mary Washington has meant and what I have learned. It is not easy to encapsulate 4.5 years worth of experience into a few blog posts. Where does one even begin? I’m not quite sure. I plan on writing on many things and I do not know if there will be any cohesive narrative in the end but, I know I need to start writing. There is too much that I have learned and experienced that I need to set down on digital paper before time and distance changes the memories. Before I begin to write about my experience I would like to take the time to thank the many people who helped me reach graduation .First of all I am blessed with a supportive family who have been with me through so much. I have many friends who struggled on this college journey with me. I’ll always look back on my time at Mary Washington as a great time in my life for friendship, laughter and all the good things that make life enjoyable. There are many faculty and staff members (many of whom I now consider friends) that supported me through their teaching and friendship these last few years. So thanks to Jefferey McClurken (my long suffering adviser); Steve Greenlaw (who opened the door for so much); members of DTLT past and present, Martha Burtis, Jim Groom, Patrick Murray-John, Andy Rush, Jerry Slezak; the numerous teachers (and I use that term not in a strict sense of teacher) at the university who have taught me so much (in no particular order and forgive me for not linking to you all): Gardner Campbell, Teresa Kennedy, Zach Whalen, Nina Mikhalevsky, Jack Bales, Mara Scanlon, Krystn Moon, Sue Fernsebner, Neva Trenis, Bob Ekey and many more professors I had the pleasure of getting to know. The list of people is long and likely if you read my blog you have helped me along my journey in some way, so thank you! The future is uncertain right now. 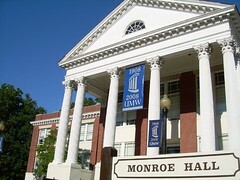 I just hope that wherever I go that I will remember the lessons I have been taught at Mary Washington. And more importantly for me, I hope I remember the words of the many people who have faith that I will do something great with my life. Thank you all.